I find interesting pattern everywhere. It’s something I can’t turn off, nor would I want to. 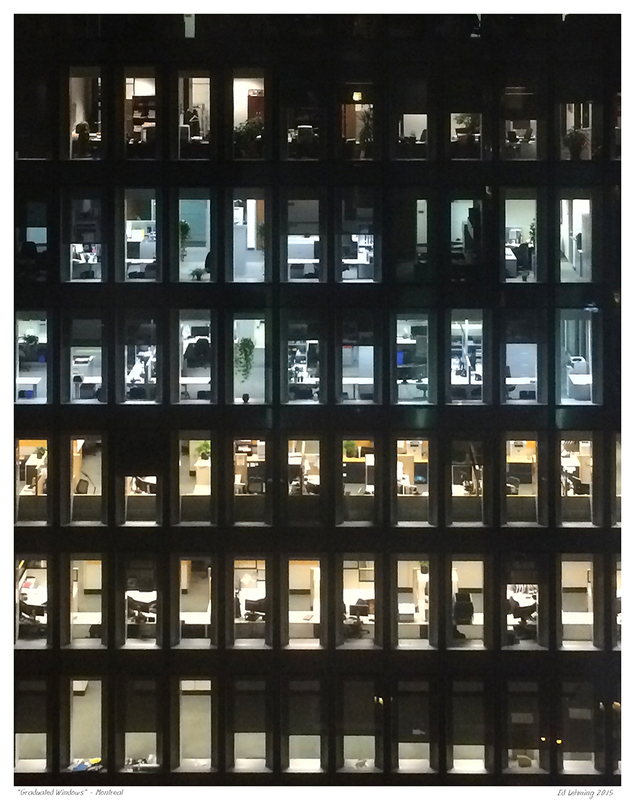 Last week, during a trip to Montreal, I looked out my hotel window which faced an office tower cross the street.It would seem that different companies have varied tastes in lighting and this building went from bright warm lighting, to a cooler ‘sunlight’ style light, to dimmed lights. The unfortunate thing was that the hotel windows were quite dirty and I was not able to sharpen the image beyond this. I had my Nikon DSLR with me but those shots were not much better than the iPhone. So, here it is. From a distance, people think this is a contact sheet and then they look closer. Every window seems like its own little world and no two are exactly alike. I hope you enjoy it. This entry was posted in Photography and tagged blue, cool, graduated, hotel, iPhone, light, Montreal, office, windows, worm, yellow on May 29, 2015 by Ed Lehming Photography. A simple photo of three columns at Place d’Armes in Old Montreal. The building is directly across the square from the well known Notre-Dame Basilica. I simply enjoyed the form and details of the columns. I’m not sure if this would be street photography, urban, or architectural. Technically, it’s travel photography, though I did not travel far. 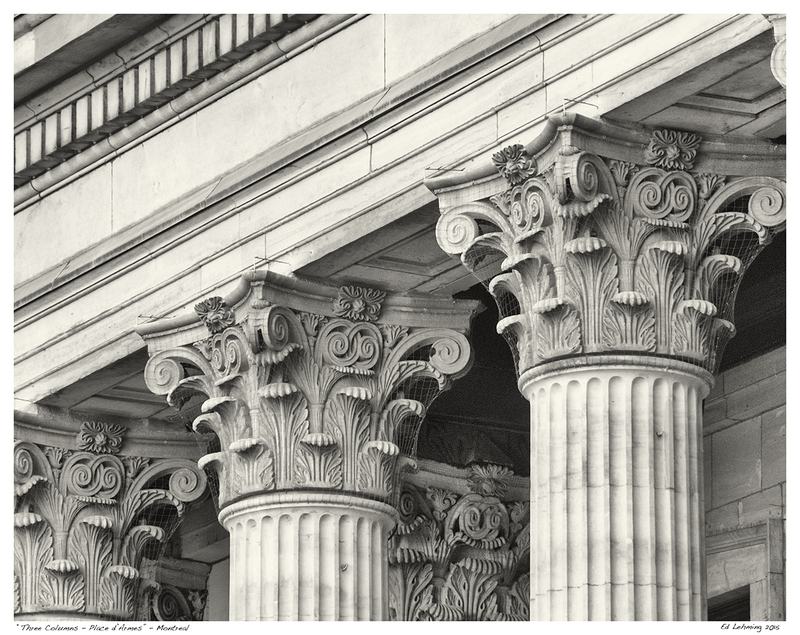 This entry was posted in Photography and tagged architecture, black & white, column, Corinthian, Montreal, old, Street, toned, Travel on May 22, 2015 by Ed Lehming Photography. This entry was posted in Photography on May 18, 2015 by Ed Lehming Photography. It’ the first long weekend of the summer. Victoria Day, here in Canada. 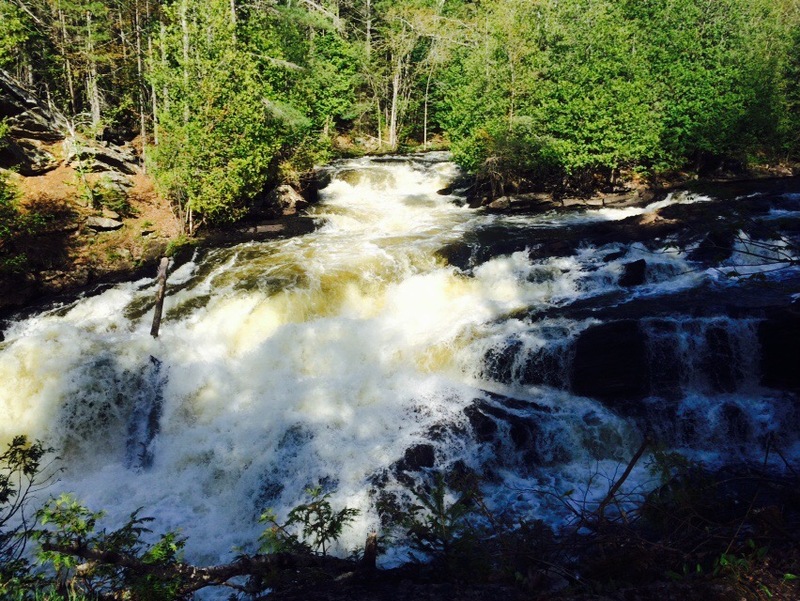 For many, this is the start of cottage season, camping season, times in the outdoors. It’s the time of black flies and mosquitoes. But for me, it’s the time to just unwind. There is something about being on the water or near the water that creates serenity for me. I can sit for hours on the shore or in a canoe just being near water. The clouds are ever changing, ever moving. The day progresses from foggy mornings, to warm afternoons, and ends with beautiful sunsets. I watch wildlife in action on the shores and in the water. Dragonflies flit and fly like crazed helicopters among the shore plants and bullfrogs share their voices in and ongoing evening chorus. Yes, another start. Time to get out there and enjoy it. This entry was posted in Photography on May 17, 2015 by Ed Lehming Photography. One of the unfortunate characteristics of our generation is that we have tended to live highly structured lives. Those of us born in the 1980s, who spent their twenties in the transitional era of the early 2000s, amidst the violent cacophony of the two Bush Wars, have experienced at least some shared sense of structure to our lives. The typical life of an upper-middle class son or daughter born in Canada during that generation would go something like this: a childhood spent in public schools, with no lack of activities in which to immerse oneself (soccer, piano, theater, etc.). Then high school hits, with its swirl of hormonal desire combined with the looming pressure of standardized tests. It is generally here that the adolescent learns the rhythms of capitalist work-time: school during the day, nights filled with study and ever more structured activities. This entry was posted in Photography on May 15, 2015 by Ed Lehming Photography. As spring continues, more colour and new life emerges, following the cycle of death and re-birth. The delicate structures of new leaves exploding from once tight buds are part of that cycle. A few short days ago, these red maple leaves were just bumps on a branch. Now, you can see the future shape in miniature. The soft morning light created a nice back-lit effect that shows all the structures nicely and soft focus blurs another cluster of leaves in the background. There is something soothing about these photos. I think it’s the freshness and promise each sign of new life holds. 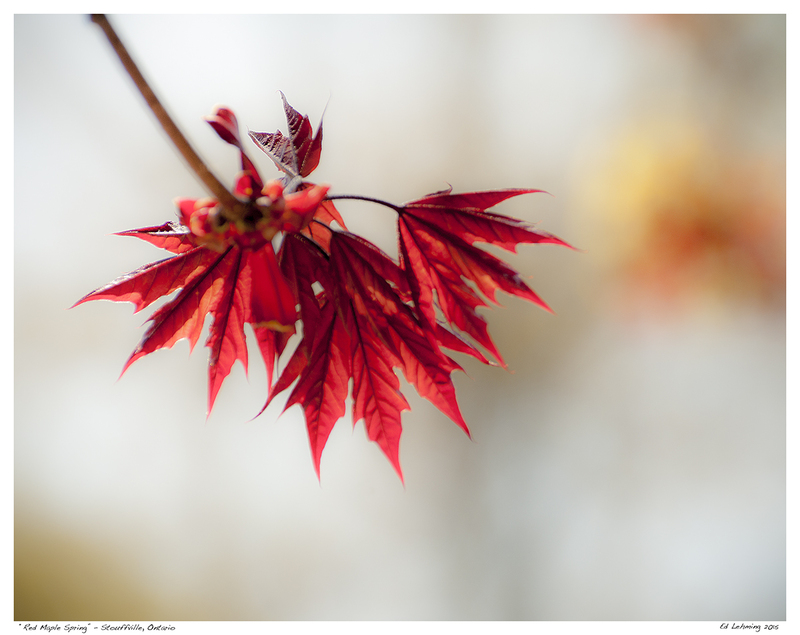 This entry was posted in Photography and tagged bud, emergence, fresh, hope, life, maple, new, promise, red, soft, soothing, spring on May 15, 2015 by Ed Lehming Photography. I went for an early morning walk this morning and was greeted by yet another gift of spring – a beautiful crab-apple tree loaded with delicate pink-white blossoms. The sun was just up and provided a wonderful soft light. I tried to keep as much of the flower-head in focus while keeping the background soft. I spent quite a bit of time with this particular subject and will be posting more photos in the next few days. 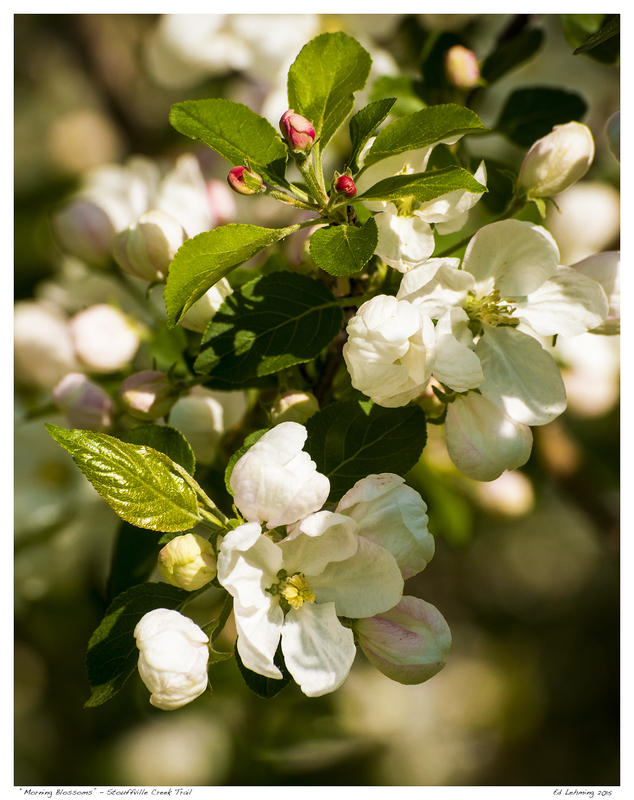 This entry was posted in Photography and tagged apple, beauty, bloom, blossom, crab-apple, filed, morning, Nature, pink, spring, Stoufffville, walk, white on May 14, 2015 by Ed Lehming Photography.